The ultimate present to the male population, Ava Gardener was born Christmas Eve, 1922, in a rural impoverished part of North Carolina. She was a true Southern belle, but you might never guess that; her early studio home MGM sent her to a speech coach immediately after signing a contract in 1941 in order to 'correct' her Carolina drawl. She was discovered by a talent scout, who noticed a portrait of the young beauty hanging in the window of her brother's photography store. Though she signed her contract in 1941 (at just nineteen! ), it wasn't until five years later that Ava had her first starring role, in the breakout noir thriller The Killers, with Burt Lancaster. The film catapulted her to stardom, but Ava found it difficult to find roles that were challenging to her. 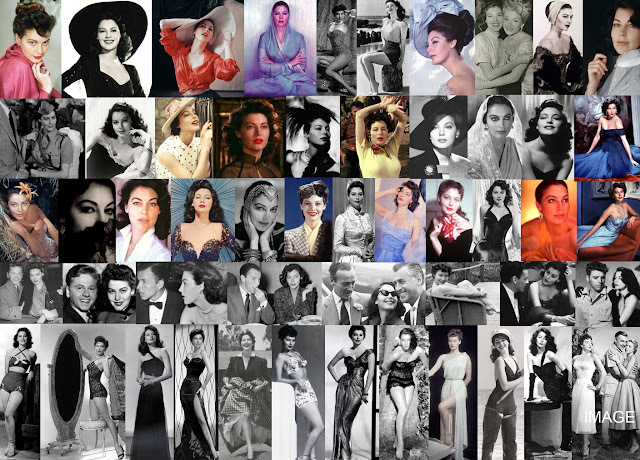 Mostly cast as a beautiful 'space-filler' in MGM productions, Ava worked a lot on films produced by other studios. MGM finally gave her the chance to shine again in the 1951 production of Show Boat, a musical in which she portrayed biracial singer Julie LaVerne. Ava fought aggressively for the role, beating out her good friend and singer Lena Horne. Despite the success of the film and the strength of her performance, Ava was hurt when she found out her vocals were redubbed for the final release of the film. In one of the That's Entertainment films, a scene containing Ava's original vocals exists - and they sound lovely! I don't know what MGM was thinking to be honest. Two years later, Ava shined again in the lavish adventure film Mogambo, set in Africa and costarring Grace Kelly and Clark Gable. Ava was awarded an Academy Award nomination for her portrayal of the brash 'Honey Bear' Kelly. Playing the femme fatale was a strength of Ava's, who showed this skill yet again in arguably her most famous performance as The Barefoot Contessa, opposite Humphrey Bogart. The Spanish location shooting changed Ava, who became an avid fan of bullfighting and flamenco dancing during the production and eventually moved to Spain a few years later. She continued to give powerhouse performances in such films as Bhowani Junction and Night of the Iguana. Ava was married three times; her husbands were Mickey Rooney (1942-1943), Artie Shaw (1945-1946), and to Frank Sinatra (1951-1957). Despite her marriage to Artie Shaw, she and fellow ex-wife of Shaw, Lana Turner, were quite good friends. Ava was said to have been the great love of Frank Sinatra's life. She is credited with helping him turn around his career. When they were first married, Ava was the bigger star and bigger money-maker. Frank was in a career slump, and often borrowed money from Ava to afford presents for his children with Nancy Sinatra. She helped get him his role in From Here to Eternity that helped relaunch his career. Hindered by the drinking, busy schedules, and extramarital affairs on both sides, the Gardner-Sinatra marriage was tempestuous at best. Reportedly, Ava became pregnant sometime during her marriage to Sinatra, but had an abortion, causing further strain on their relationship. Though their marriage was tumultuous, he wrote some of his best music (In the Wee Small Hours, and Frank Sinatra Sings for Only the Lonely) during their marriage and eventual breakup. When she made Contessa, a statue of her was given to Frank as a gift. He kept it in her backyard for years after their divorce. It wasn't until he married Barbara Marx in 1976 that he was forced to get rid of it. Sinatra never forgot Ava in his heart; he paid for her medical expenses after her stroke in 1989. She had a famous rapport with her costars. Former On the Beach costar Gregory Peck loved Ava so, that after her death in 1990, he took in her longtime housekeeper Carmen Vargas and Ava's Welsh Corgi to live with him. Ava was set in her convictions. She decided early on in life that there was no point for her to read books for recreation. As a result, she had professed in 1945 (when she was in her early twenties) to having read just two books: Gone With the Wind, and The Bible. This lead to a funny encounter between her and J.R.R. Tolkien, when neither of them knew why the other one was famous. This didn't keep her from making friends with other writers, such as Ernest Hemingway (whom she affectionately called 'Papa') - she starred in three film adaptations of his works and often accompanied him to bull fights. In the end, Ava was a prime example of 'you can take the girl out of the country, but you can't take the country out of the girl.' However gussied up, plucked, primped, and primed Hollywood made her, Ava herself maintained that "I have always been a country girl and still have a country girl's values." She spoke the way she wanted to and didn't censor herself for anyone, to the point that on Australian reporter compared her foul language use to "a sailor and a truck driver having a competition." After throwing a glass of champagne in the face of another reporter who upset her, he wrote that while she was doing it "the only thing I could think of was how bloody gorgeous the woman was." After my screen test, the director clapped his hands gleefully and yelled, "She can't talk! She can't act! She's sensational!" All I ever got out of any of my marriages was the two years Artie Shaw financed on an analyst's couch. When I lose my temper, honey you can't find it anyplace. [On acting] Nobody ever called it an intellectual profession. I must have seen more sunrises than any other actress in the history of Hollywood. I haven't taken an overdose of sleeping pills and called my agent. I haven't been in jail, and I don't go running to the psychiatrist every two minutes. That's something of an accomplishment these days. I couldn't imagine a better place [than Australia] for making a film on the end of the world. Maybe I just don't have the temperament for stardom. I'll never forget seeing Bette Davis at the Hilton in Madrid. I went up to her and said, "Miss Davis, I'm Ava Gardner and I'm a great fan of yours." And do you know, she behaved exactly as I wanted her to behave. "Of course you are, my dear," she said. "Of course you are." And she swept on. Now that's a star. Some people say Liz [Taylor] and I are whores, but we are saints. We do not hide our loves hypocritically, and when in love, we are loyal and faithful to our men. I wish to live until 150 years old, but the day I die, I wish it to be with a cigarette in one hand and a glass of whiskey in the other. I think the main reason my marriages failed in that I always loved too well but never wisely.